ETLG Ltd: ETLG Inertial Aerosystems announce the eCompass strap down electronic compass. It combines a precision 3-axis solid state magnetometer and a rugged 2 axis electrolytic tilt sensor to provide accurate, compensated heading and tilt measurements over a wide temperature range. Refined firmware and signal processing deliver the ultimate in performance from the available sensor data. Heading accuracy is .5⁰ rms with tilt <35⁰and dip <60⁰over an operating temperature of -40⁰to 105⁰C. Compensation for hard and soft iron influences is built-in. A wide variety of industry standard output formats are available via RS232 or RS485 interfaces. The compass is available in either a plastic enclosure or, for more rugged applications, an aluminium enclosure with a metal connector is available. 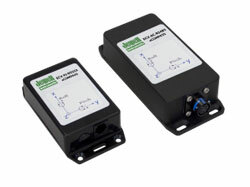 An auxiliary connector allows calibration and tuning where the compass is already installed in a system. A development kit including compass, cable and software is available.